Quite a bit, actually. Not all of it is totally new, per se, but there’s a lot that’s worth paying attention to. So this year, I paid close attention, so you don’t have to. 1) The First Course Kickoff Party — this the second year for this kickoff event, and it’s going to be bigger and better. It’s basically a big, Dallasy, food-focused party for charity. You know the type. 2) Tre Wilcox. Do you like Top Chef? Do you like muscles? Do you like handsome men with muscles who can cook like whoa? Then you’ll probably want to meet and greet with chef Tre Wilcox at the aforementioned First Course Kickoff Party. He’s new this year. 3) $20, 2-course lunches, so really anyone with a twenty can get in the Restaurant Week game during their lunch hour. I’m a fan of this. 4) The close-kept reveal. The list of restaurants has been a secret until “Reservation Day,” AKA today. Meaning, the scramble to make reservations will be even more exciting. GO!!! 5) There’s a new silent art auction at the kick-off party for art pieces donated by Daniel Padilla Gallery that will benefit the charities as well. 6) DOUBLE Central Market Fourth Course certificates TODAY ONLY at Central Market locations. This is the bonus course you get with any $25 purchase at CM (easy as pie — quite literally, like, buy a couple pies and you’re there). Today only, you get 2 certs for your $25 purchase. That’s certainly worth the trip to my favorite grocery store in town. DALLAS / FORT WORTH, Texas – June 22, 2015 – Let the countdown begin for North Texas’ hottest summer dining event, the 18th annual DFW Restaurant Week presented by Central Market! The official list of participating restaurants will be unveiled on Reservation Day, Monday, July 13, and diners may begin booking August reservations at more than 125 restaurants. DFW Restaurant Week supports the North Texas Food Bank in Dallas and Lena Pope in Fort Worth, with proceeds raised from participating restaurants benefiting local children and families in need. The campaign will launch with the First Course: DFW Restaurant Week Kick-Off Party at a stylish new location, Sixty Five Hundred, on Aug. 6, with tickets available starting today. Diners can enjoy a different scene and cuisine each day as they select from more than 125 top restaurants offering delicious three-course prix fixe dinners for either $35 or $45, or the newly revamped Cadillac Lunch Experience brought to you by Oak Farms Dairy, featuring new two-course lunches for just $20 at select locations. Twenty (20) percent from each meal purchased will be donated to one of the charity partners in either Dallas or Fort Worth. Central Market Fourth Course Certificates – Spend $25 at local Central Markets during DFW Restaurant Week and receive a certificate at the Info Desk for a FREE, additional dinner course at participating restaurants! Shoppers can earn DOUBLE certificates on Reservation Day, July 13! 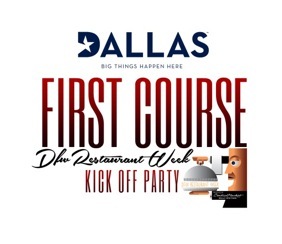 First Course: DFW Restaurant Week Kick-Off Party, Thursday, Aug. 6 – Tickets Available Today! One of Dallas’s most chic culinary celebrations is kicking off DFW Restaurant Week on Thurs., Aug. 6, with special guest and “Top Chef” Tre Wilcox, who was also named ‘Best Chef’ named by The Dallas Morning News! Guests can join in the foodie frenzy and support the North Texas Food Bank and Lena Pope with an exclusive “first taste” of delicious fare and craft cocktails from local restaurants at one of Big D’s most chic entertainment venues, Sixty Five Hundred. Tickets go on sale today at FirstCourseDFW.com! The 18th annual DFW Restaurant Week presented by Central Market is also sponsored by CBS RADIO DFW, Metroplex Cadillac Dealers, AIWF, D Magazine, Texas Beef Council, Oak Farms Dairy, OpenTable, Sysco, FreshPoint and 360 West Magazine. For more information or details on exciting promotions offered with DFW Restaurant Week 2015 and its partners, please visit dfwrestaurantweek.com and follow us on Facebook, Twitter, and Instagram. Don’t forget to use #DFWRestaurantWk when posting! Celebrating 18 years in 2015, DFW Restaurant Week presented by Central Market (formerly KRLD Restaurant Week), was founded by NewsRadio 1080 KRLD in August 1997. Since its creation, the event continues to flourish as a popular marketing and fundraising opportunity and has helped raise millions for the supported charity partners the North Texas Food Bank and Lena Pope Home. For the full dish on Dallas/Fort Worth’s hottest summer food and wine event, please visit dfwrestaurantweek.com. The North Texas Food Bank (NTFB) is a top-ranked nonprofit relief organization. Leading the fight against hunger in our community, we distribute donated, purchased, and prepared foods through a network of more than 1,000 programs and more than 200 Partner Agencies across 13 counties. Since 1982, NTFB has distributed more than half a billion pounds of food. NTFB supports the nutritional needs of North Texans through research, education, advocacy and strategic partnerships. In fiscal year 2014, NTFB provided access to 62 million nutritious meals. NTFB is a member of Feeding America, a national hunger relief organization. More than 80 years ago, Lena Pope Home began providing hope for North Texas children. Since its founding in 1930, the programs offered by Lena Pope have evolved to meet the changing needs of the community. Today, with early intervention and prevention programs, we help create hope, happiness, and success for children and families through two focused areas: counseling and education. First Course: DFW Restaurant Week Kick-Off Party – Sip and savor in style with celebrity “Top Chef” Tre Wilcox to kick-off the 18th annual DFW Restaurant Week presented by Central Market! Join in the foodie frenzy and support the North Texas Food Bank and Lena Pope with an exclusive “first taste” of delicious fare and craft cocktails from local restaurants at one of Big D’s most chic entertainment venues, Sixty Five Hundred. This festive event is a culinary crusade not to be missed! VIP Admission: 5:30 – 7 p.m.; General Admission: 7 – 10 p.m. GIVEAWAY: Dallas Observer Brewfest Tickets! Plus: @DallasObserver #Brewfest PRESALE!